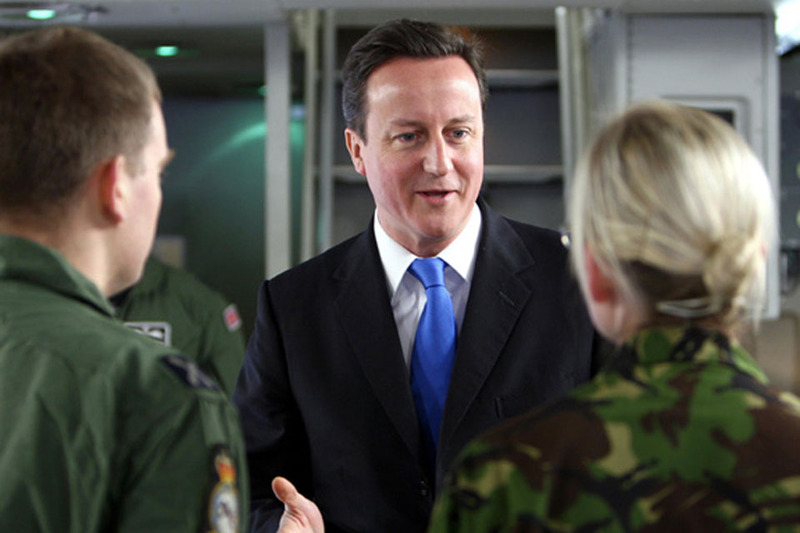 Prime Minister David Cameron praised the work of Service personnel who provide the 'airbridge' between Britain and Afghanistan today as he took to the flight deck of the RAF's newest transport plane. 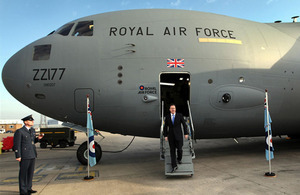 Paying a visit to RAF Brize Norton in Oxfordshire, Mr Cameron said the newly-delivered C-17 Globemaster showed the Government’s commitment to succeed in Afghanistan. The aircraft, the seventh C-17 acquired by the RAF, is capable of flying non-stop to Afghanistan and can carry up to 138 people, a Chinook helicopter, or up to three Warrior armoured vehicles. Mr Cameron was given a tour of the American-built C-17, which is also equipped for medical evacuation flights, by Brize Norton’s Station Commander, Group Captain Dom Stamp. What I am looking at today is the investment that we’re making to make sure that we succeed in Afghanistan, and make sure we have got the very best airbridge between Britain and Afghanistan,” the Prime Minister said. This aeroplane can carry three Apache helicopters, it can take a whole Chinook helicopter. It’s a very, very efficient piece of equipment and it’s very good news that we are investing in this - evidence that we’re giving our Armed Forces the capability, the flexibility and the mobility that they need to do the job that we ask them to. It’s lovely to be here and say thank you to the people who are working very hard to make sure the airbridge between Afghanistan and Britain is open and working well. Brize Norton is currently staffed by around 4,000 Service personnel, although that number will eventually rise to around 7,000 as operations transfer from RAF Lyneham in Wiltshire over the summer. Group Captain Stamp praised staff for coping with the ‘worst that the British winter could throw at us’ in recent months and for their year-round efforts to support military colleagues serving in Afghanistan. They do a phenomenal job day-in, day-out, throughout the year. It’s lovely for the Prime Minister to come down to say thank you. The C-17 can be converted rapidly to offer intensive care provision. In this role it provides exceptional support to the aeromedical airbridge, with one aircraft on standby 24-hours-a-day to fly seriously injured personnel back to the UK at short notice. In addition, the aircraft have been deployed to help with humanitarian and disaster relief efforts around the world. The C-17 fleet provided assistance during the aftermath of the Indian Ocean tsunami, as well as the Pakistan and Chilean earthquakes. The RAF’s C-17 fleet has provided outstanding service in support of operations and humanitarian relief efforts around the world. The fleet has already clocked up an impressive 65,000 flying hours during its missions. The C-17 is a real workhorse in the RAF fleet.